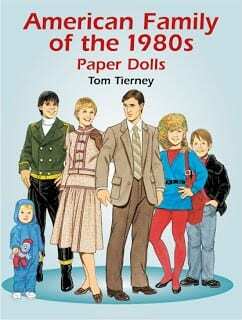 Kimberly here with some thoughts and layouts about the teen years. I’ve been doing a lot of thinking lately about my teenagers. I’m in deep with them right now. My son is 18 and graduated from high school last week. My daughter just finished 10th grade and I am teaching her to drive. Overall, it’s a stressful, anxiety provoking time. It’s quite easy to let the strong emotions and feelings take over and forget to look for the joy in all this madness. Thankfully, Renne is one step ahead and is producing some perfect kits to help us see the fun and playful side of adolescence. 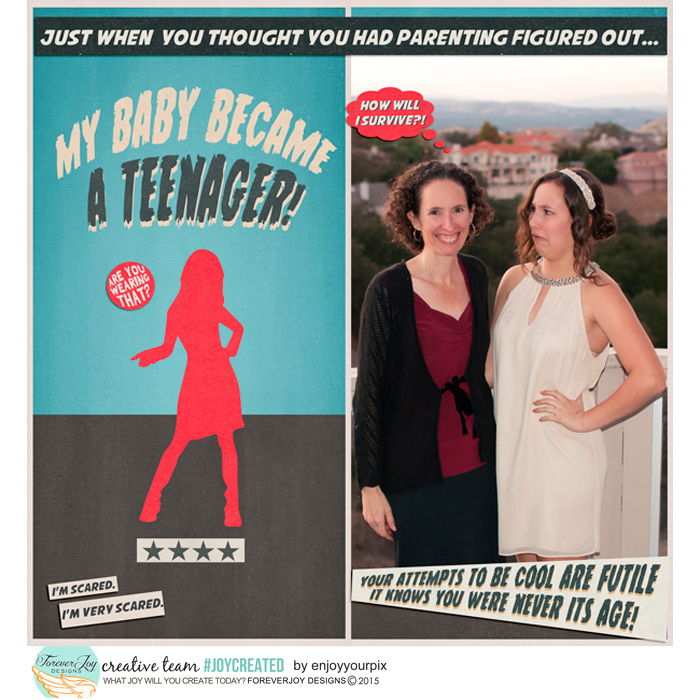 She has produced two amazing kits that embrace the teen years. Last year, she created THIS IS SCARY and I fell in love with it right away. This great kit and journal card set remind us how important it is to keep a sense of humor. 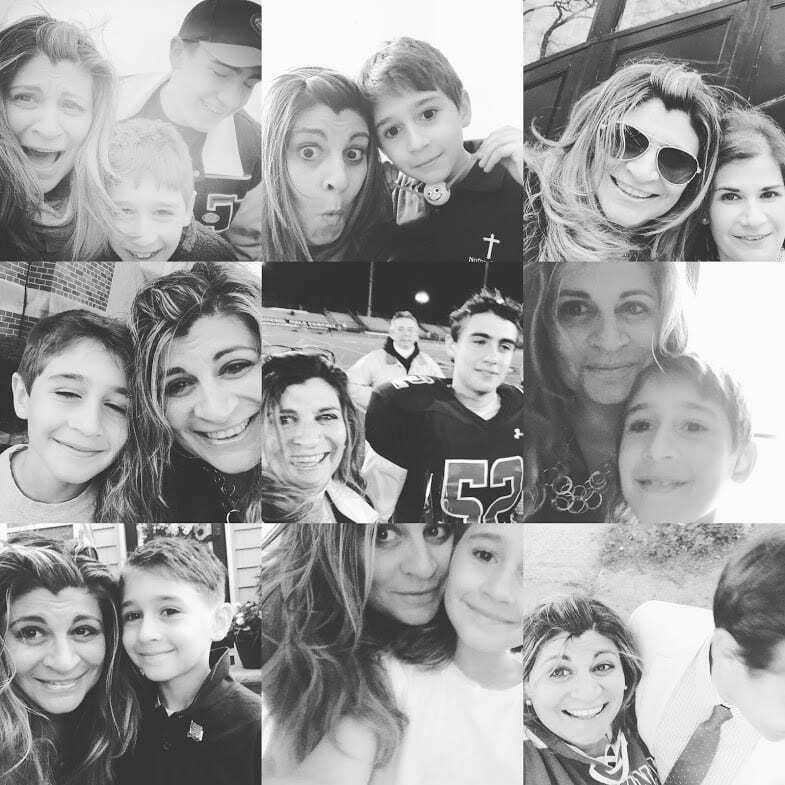 When we get mired down in the challenges of raising teenagers, it’s so hard to push pause and just enjoy this crazy time of life. In the spirit of embracing the craziness, I have a few layouts with THIS IS SCARY. 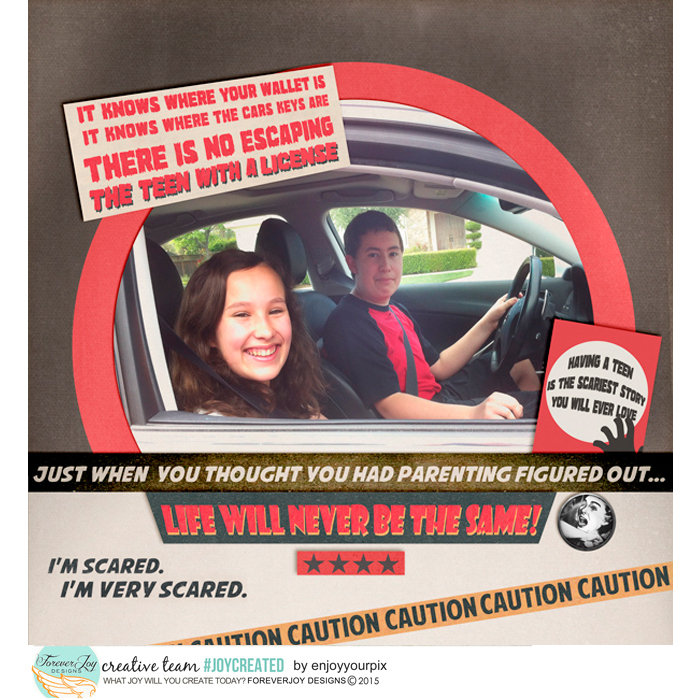 First up, not much is scarier than seeing your kids in the car together with one of them behind the wheel. Furthermore, a mother-daughter relationship, is a wonderfully complex and maddening one. Here, with my photo-ham of a daughter, we are posing for pre-Homecoming photos. When I was her age, I was often mortified by my parents. What goes around comes around, right? 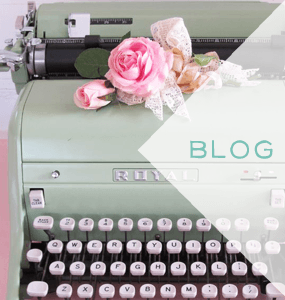 Just a few days ago, I made this layout for Mission Impossible Challenge over at The Lilypad. I must say, I had a ton of fun with his. This is so completely my life right now. And now, Renne has once again spoken my truth with her newest teen kit. 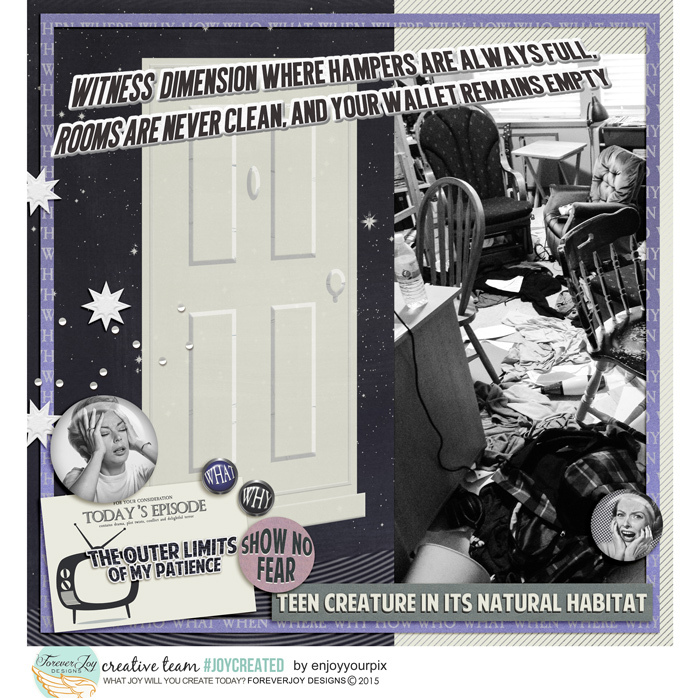 TEEN PARENT ZONE is the perfect kit to help us document this insanity we call adolescence. The Twilight Zone vibe is perfect for me too because I remember when I was a teenager, I loved watching the old black and white episodes on TV. Did you get a chance to watch the hilariously video Renne made? Check it out here. I’ll wait. I had a play with TEEN PARENT ZONE. I took a risk in my scrapping here. I put a photo of the disaster we call my son’s bedroom. I usually post more edited real life moments but here I just went with the truth. The room drives me crazy. It’s caused many fights over the years. Nevertheless, I have realized that this is him right now. I’m here to help him, but I’m done fighting. Don’t tell my son, but as soon as he leaves for college (Thursday, August 20, 2015, not that I’m keeping track or anything), I am going into that room and gutting it. Thanks for reading! 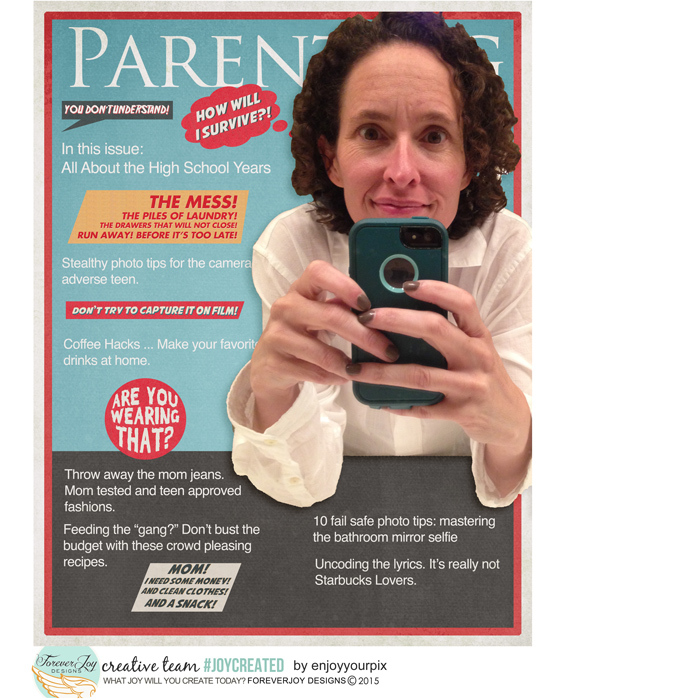 I’d love to see your layouts featuring the perils and pitfalls of puberty!! 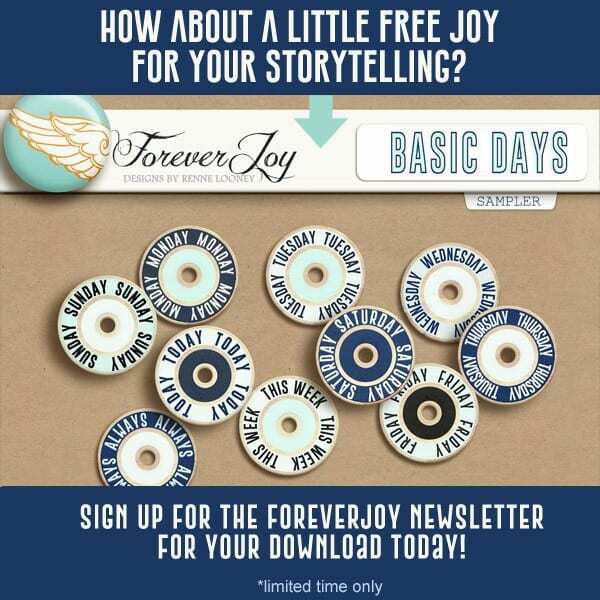 Tag #joycreated in the ForeverJoy Designs Gallery at the Lilypad and we’ll keep an eye out for them!